Property Size 1,036 sq. ft.
Beach House is a family oriented, well maintained low density complex. The property boasts many family activities with an oversized pool, smaller kid`s pool, shuffleboards, lighted tennis courts, game room with many game machines, exercise room, an extensive hiking biking trail accessed by just crossing the street, a club house with assorted board games, tv`s, and computer access. The huge beachfront offers wide areas for spreading out and constructing endless sand structures. With so many options there`s constant opportunity for family fun! 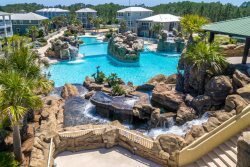 The complex resides on 650 feet of pristine beachfront-the largest per unit on the entire Emerald Coast. The private pool is heated and has a separate kiddy pool, and gazebo for relaxing. There is a large separate club house conveniently located near the pools. This condo has gorgeous views from the 4th floor of Beach House and is situated close to the pool. New tile in living area and kitchen. The Master bedroom has a king size bed and flat screen TV and DVD. The second bedroom has one queen bed and one twin bed as well as a Flat screen TV and DVD. Both bathrooms have been updated as well. The living room has a queen sleeper sofa and flat screen TV and DVD. Enjoy a fully equipped kitchen with microwave, oven, stove, fridge, dishwasher, custom cabinets, and a washer and dryer in the unit. A 25% deposit of the total rate holds the unit for you and is applied toward your rental fee. Add $110 for housekeeping and 11% for tax. There is a $69 damage protection fee, $30 booking fee and 2.50% to process credit card payments.